Maybe you’ve been dreaming about building a pool for years or maybe the idea just started bouncing around your head. Are you zoned for it? Before you break ground—before you even schedule a consultation—make sure your property is abiding by zoning ordinances for pools. Many cities have strict maintenance and liability laws regarding swimming pools and Baton Rouge does not accept any waiver in regard to these ordinances. Decide the type of pool you want: There are three main types of in-ground pools available in Baton Rouge: vinyl-lined, fiberglass, and concrete. Weigh the pros and cons of each pool carefully before deciding to build. A qualified pool builder can help you make the right choice for your backyard. Longevity: With the temperatures starting to rise, the quick installation times of fiberglass and vinyl-lined pools can be tempting. But if you’re looking for a durable pool customized to suit your vision, you may find that the longer installation time of a concrete pool—generally, between 4 to 6 weeks—is worth enduring. You should also consult with your insurance agent about extending your home policy to your pool or spa in the event of damage. Circulation system: Chlorine or saltwater, indoor or out—every pool needs a water circulation system to stay fresh and sparkling. With advances in energy efficiency, automation, and heating, an experienced pool builder can help you find a reliable, high efficiency aquatic system for your pool. How much can you maintain? If properly maintained, pools can be a valuable asset when selling your house. However, pools can last a long time—concrete pools, especially—and if not properly constructed and maintained, they can actually reduce property value. The certified pool technicians at Lucas Firmin Pools can keep your pool sparkling for years to come. Water features and lighting: When it comes to swimming pools, dynamic jets, underwater lighting, and cascading waterfalls can create the ambient atmosphere you crave. Take time to consider what additional features you want for your pool before you build. They will increase your initial budget, but adding them in later—or retrofitting—can be messy, time-consuming, and very costly. Landscaping: Do you want palms shading you from the afternoon heat or a pebble border around your pool deck? Like water features, lighting, and other accessories, proper landscaping can enhance the aesthetic pleasure a pool offers. You can get ideas online or consult with a landscaping company to create a pleasing, yet manageable green space around your pool. Determine your budget: With longevity, maintenance, and accessories in mind, it’s time to determine if you can budget for the pool of your dreams. A pool can be a wonderful way to relax, but if you can only see the expenses in your head you close your eyes, it may not be the right move for you just yet. 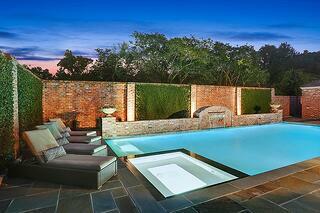 Talk with a financial advisor about the costs and benefits of adding a pool to your property. Compare prices: If you’ve checked off the last 8 items, it’s time to start comparing prices. It’s important to be diligent. In order to make a deal, some contractors may not include everything in their initial bid, which is why our last item is so important. Know your contractor: Any construction project can have unforeseen costs or setbacks. Pool construction is no different. You want your pool to be the destination for your family and friends—it’s important to hire a reliable pool construction company you trust. At Lucas Firmin Pools, Lucas and Jenny work closely with designers, architects, landscape architects and homeowners to turn every pool into a personalized paradise. With comprehensive maintenance packages and over 20 years of experience, Lucas Firmin Pools is unmatched in customer service and expertise. Contact us to schedule a free consultation today.